I like my running skirts with pockets, so I can take my cell phone, house key and some money along. But I have found that it's not just about having pockets in your running skirt. It's about where they're placed! 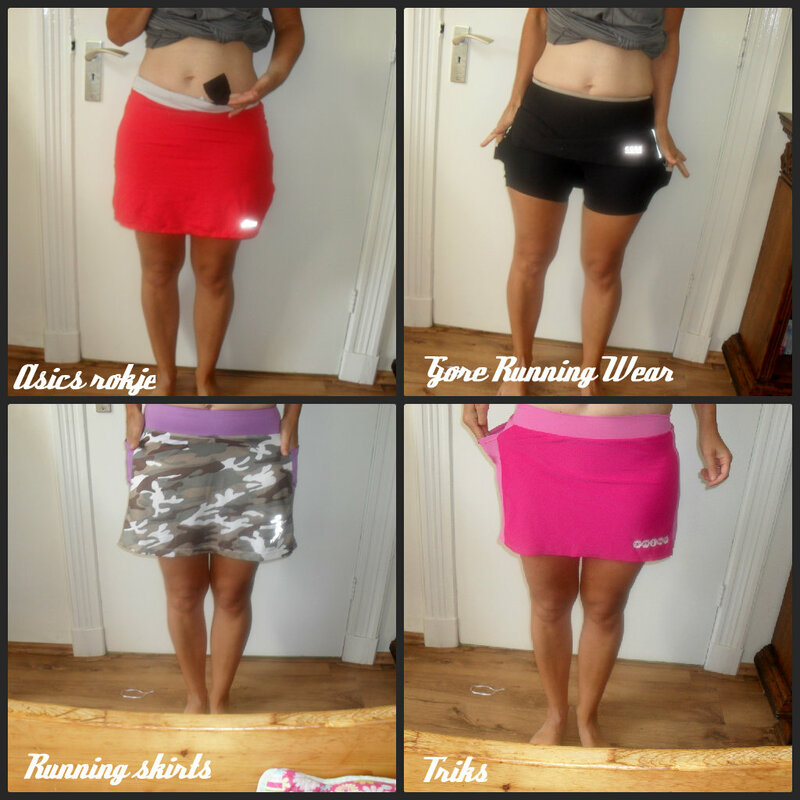 As I am the happy owner of five running skirts, I put them all on, and made a photo collage showing you where the pockets are. And now I'll tell you which running skirt offers the best pockets! My Gore Running Wear skirt is without a doubt the winner as far as pockets are concerned. It offers two pockets and they are sown onto the tight. Because of this, they don't cause any unsightly bulges and they don't spoil the line the of the running skirt. And they offer enough room for a cell phone! Whereas the people of Gore Running Wear got it exactly right, the good people of Running Skirts made the mistake of sowing the pockets into the skirt. The pockets are nice and roomy, but if you put a cell phone in them, you'll see an ugly bulge and the skirt is pulled down a bit. A pity! The bright red Asics running skirt offers pocket that is not only too small, it's also at an odd place: at the front of the skirt. I can't even put a handkerchief in without causing a bulge. Last but not least, the pocket on the Nike running skirt. It's different, because it's at the back of the skirt. I think the placing of the pocket is alright, but it's way too small. Can't put anything in there, except perhaps my housekey and some change. If you're buying a running skirt, and you like your pockets, the best running skirts are the kind that have the pockets sown into the tight because then the line of the running skirt isn't compromised. That's a brand I'd never heard of! I am so into pockets. I don't carry a phone ever, but keys, gel, etc. all need a home! I'll have to check this brand out.